Yesterday, I was seriously craving junk food. Maybe the hiatus did more worse to me than just me missing a continuous day of the SNAP Challenge. Yesterday, I've also started on my pomegranate. Today, I'm feeling a lot better in regards to craving junk food. Though today was another time I had to miss out on free food. Today and this Thursdays are senior design critical design reviews, which is where each teams presents their project and its current status and there's food to go along with it. Sigh. Thursday though, I will be missing Thai Culture night. That's a food event I'm seriously bummed about missing. =[ And then there's the Order of the Engineer ceremony, which will have food at the event. And I missed out on a friend's birthday dinner (although I was also busy that day). Missing out on free food and social food activities = Ultra sigh. Today, for breakfast, I munched on cereal without milk. I am officially out of cereal now. I will need to try new breakfast items. Eggs? 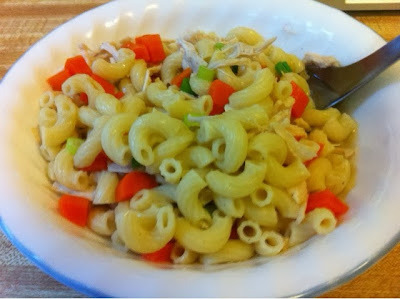 For lunch, I had leftover chicken noodle soup. Still tasty. Yum! 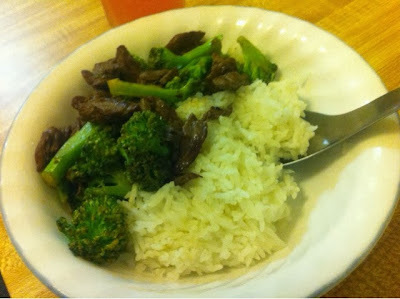 And for a late dinner -- senior design took over again, so super late dinner -- I had beef and broccoli, an asian staple. I am out of beef and broccoli now. I might go buy another stalk of broccoli though considering I still have like $2 left on my budget.